Just Jingle: All Aboard for the Stampendous! Shaped Cards Challenge! All Aboard for the Stampendous! Shaped Cards Challenge! Yup! It's Saturday and that means we have more Stampendous! Challenge inspiration for you! This month we have been having a BLAST with shaped cards and today is no exception! I had a ton of fun with my card for today! 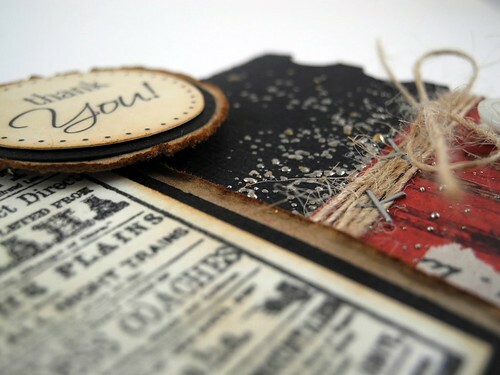 I used the Railroad Poster stamp (comes in wood or cling and is available at Michael's stores), along with some Tarnished Mica Fragments and fabulous Aged Gold embossing enamel from Stampendous! to create my card. I cut the ticket shape with the Art Philosophy cartridge on Sally the Cricut. The sentiment is a fabulous stamp from SRM Press! I love how the aged embossing enamel fit with the image so well! 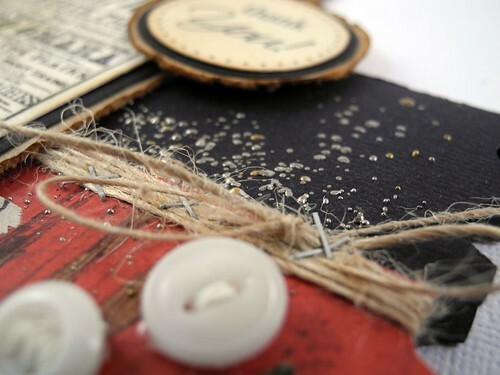 I also brought in some May Arts burlap string and some super fabulous vintage buttons! I love vintage buttons. Just say'n. The strip of patterned paper is October Afternoon and the tissue tape is from Tim Holtz. I also made use of my Tiny Attacher to add a few little staple accents. I've got to be honest. I kind of love this card. It's not a style I do all the time, but when I do I always enjoy the process! This one was WAY fun! Due to shipping restrictions, the winner must have a US address. We hope you get a chance to play along with us - happy crafting! I just LOVE this dearie!!!! One of my FAVES from all the wonderful cards you've made, Jen! The colors knock me OUT! Something SPECIAL about the way you put it together, too! REALLY cool! I know my Michaels has not gotten any new stamps in ages, but have been promising new stock. I HAVE to check for this one! I love the old vintage look and your card details are terrific! Been caring for aging parents but plan to make more time for scrapping very soon! Thanks! Wonderful Frantage-y goodness! 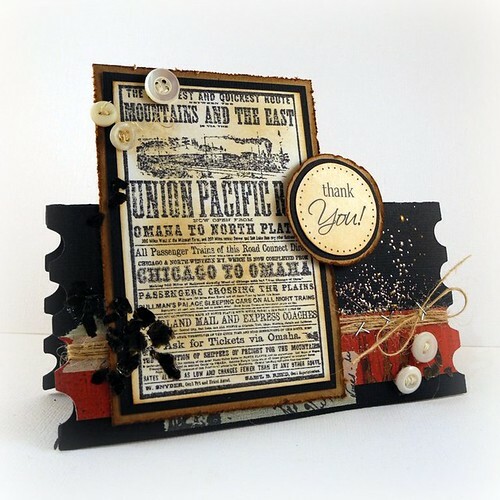 Love how you create the card base to mimic perforated tickets! wow this is just lovely the way you used these darker colors! Jen, I LOVE your masculine vintage cards! I love that stamp, neat card. Seriously? I love every single thing about this card. Awesome. This is a COOL card! Love all the textures and the tiny attacher staples.. I don't use staplers on my pages that often but it just so happens I did do so today on a boy layout! I really need to do it mmore often, LOL! OMG! This card is fabulous! It rocks! wow love love love this card!!!! Jingle...it is saying my link al ready exists and I am not seeing my link up?! Incredible! 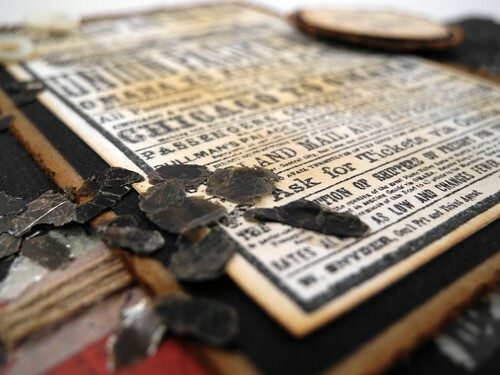 Love the fragments, the ticket shape and of course the poster stamp. I just saw a movie about the making of the Canadian Pacific Railway. Your card is the perfect representation of that exciting time. my post is number 20 I think still not seeing it...joy!! !